The formula was not invented, however, by the Risi film. In 1955, Mauro Bolognini (born in 1922), a director who later turned to dramatic films, often of literary origin, had in fact put his signature to an engaging film, GLI INNAMORATI (THE LOVER BIRDS), which presented the amiable portrait of the joes, johns and marys of the working-class neighborhood: Marisa the trouser-maker, in love with Nando, mechanic and matinee idol of the picture story magazines; Franco the soft-drink vendor and Otello the barber, rivals for the attentions of the pretty hair-dresser adultery. The action takes place in a small square, rather in the way of a stage-set, where the rituals of friendship, love and jealousy are acted out. The young actors including Cosetta Greco, Franco Interlenghi, Antonella Lualdi, Sergio Raimondi, Valeria Moriconi and the still virtually unknown Nino Manfredi. That the film paved the way for the POVERI MA BELLI cycle and shared the same spirit is indicated by the presence of the same script-writers, Franciosa and Festa Campanile. Another story by Franciosa and Festa Campanile was used by Bolognini for his next film comedy, GIOVANI MARITI (YOUNG HUSBANDS), which shows a group of recently-married young boys at the first crucial moment of marriage when they are suspended between the determination to carry on and the nostalgia for the free irresponsibility of before. 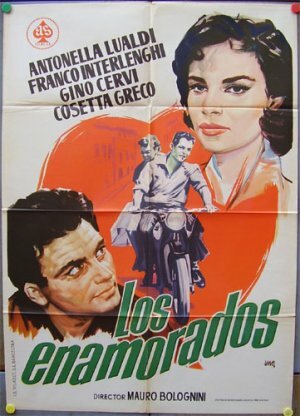 An intelligent comedy, accurate in its psychological description of the characters and tinged with an indelible streak of bitterness, it won for Franciosa, Festa Campanile, Bolognini, Enzo Currelli, Luciano Martino and Pier Paolo Pasolini the prize for the best script at the 1958 Cannes Festival. Marisa Allasio, the actress launched by POVERI MA BELLI (POOR BUT GOOD-LOOKING), had a film all to herself in 1957, MARISA LA CIVETTA (MARISA THE FLIRT), directed by Bolognini and written, among others, by Pasolini. In CAMPING (CAMPGROUND: 1958), Franco Zeffirelli's first film, she was the over-enticing girl grappling with jealousies and scoldings from her brother and fiance, respectively Paolo Ferrari and Nino Manfredi, who also helped with the script.